Starbucks announced a change to its loyalty rewards program this week. Sorry, let me correct that: The cheapest customers are furious. Contrary to popular perception, for the majority of customers who purchase more than just black coffee, the sum benefit of the program will be unchanged — and even improved for many. Before you take to Twitter with entitled rage, take a moment to consider the actual numbers (and a little business logic). Come April, the new rewards program will offer loyalty members two stars per $1 spent. Members have to earn 300 stars to achieve “Gold” level, when they’ll earn a free drink or food item for every additional 125 points earned. The current program awards one point per transaction, regardless of the amount spent. It takes 30 stars to achieve Gold level, plus 12 additional stars to earn the free food or drink. The new program means everyone has to spend $62.50 to earn a freebie. If you spend a little over $5 per visit, your rewards won’t change. You’ll earn your free reward in 12 visits at $5.20 per visit. You could hit that with a Grande Fresh Brewed Coffee ($2.10), plus a Turkey Bacon Breakfast Sandwich ($3.45). The new program “reflects the number one request [heard] from members: more Stars awarded based on what you buy, no matter how often you visit,” according to Starbucks. Under the new program, the average loyal customer will earn the same rewards in fewer visits. To see greater benefits under the new program, you have to spend at least $5.60 per visit. The average Starbucks transaction costs $7.67, according to a study across five major cities. 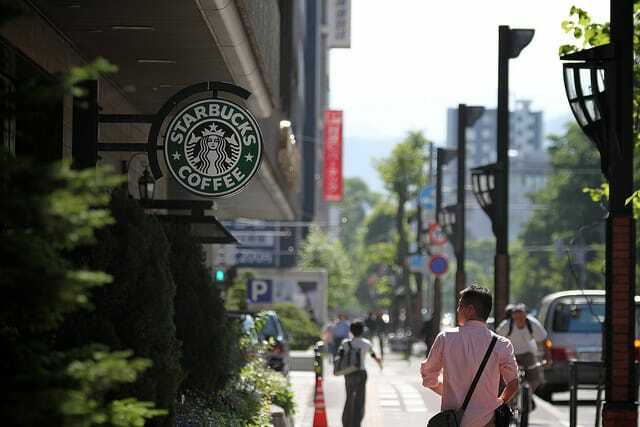 The average Starbucks customer visits the store six times per month, while a loyal 20% of customers go 16 times per month, Business Insider reports. Based on those stats, the average loyal customer will earn two free drinks per month, instead of 1.3 under the existing program. At one star per visit, the average loyal customer would earn 16 stars per month with the existing program. At two stars per dollar spent, at the average transaction rate, the new program will earn that customer 245.44 stars per month. Assume one of those monthly visits is the new monthly Double Star Day: You’d earn 260.78 stars per month, or two free items. For some Starbucks customers, the benefit of the rewards program is reduced. If you spend less than $5 per visit, you’ll have to go more often to earn the same rewards. For example, if you order a Grande Skinny Vanilla Latte on each visit, you’ll have to stop in 15.8 times to earn your free drink — instead of 12. If you were ordering a Grande Fresh Brewed Coffee to earn one star per visit, you’d have spent just $25.20 to earn your free drink. You’ll now have to spend $62.50. But you’re spending a quarter of the average Starbucks visitor. Those customers spending four times what you do are actually more “loyal” to the brand, so they get better loyalty rewards (that’s the business logic I mentioned). If you’re a regular brewed coffee drinker and you’re mad about the change, here’s a way to get more bang for your buck. Buy Starbucks coffee at your grocery store or online, and brew it yourself. At coffee shop standards, a one-pound bag of Starbucks coffee yields about 64 5-ounce cups — or about 21 Grande (16-ounce) cups. This 1-pound bag of coffee for $14.95 can replace $44.10 worth of coffee in the shop — saving you $29.15. In addition to earning stars for your Starbucks purchases, earn bonus stars for referring friends to the program, too. You can also get more for your money buying discounted Starbucks gift cards online and applying the balance to your account. Use these hacks to get more for your money at Starbucks, but note the ones that save you cash also mean you’ll earn fewer points. Your Turn: Are you a Gold member? How will the new Starbucks rewards program affect your coffee-buying habits?